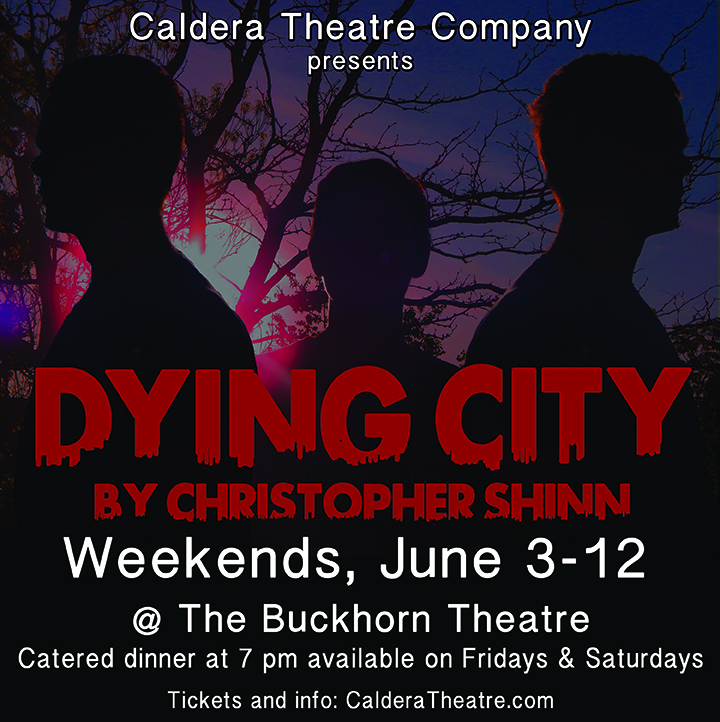 Livingston’s Caldera Theatre Company (CTC) will present the Christopher Shinn drama Dying City at the Buckhorn Saloon & Theatre, 5237 Hwy 89 South (next to Rosa’s Pizza). Performances will be held for two weekends: Fridays and Saturdays, June 3, 4, 10 and 11 at 8:00 pm and Sundays June 5 and 12, at 3:00 pm. Performances on Fridays and Saturdays will offer the option of a catered dinner one hour before the show. Admission is $35 for dinner plus the show or $15 for the show only. Advance tickets are required for dinner reservations, and tickets for just the show may be purchased in advance or at the door. Either ticket may be purchased at Elk River Books, 120 N. Main, or through our secure account (either PayPal or credit cards) with the links below. Dubbed a “low-simmering psychological mystery” by the Washington Post, Dying City tells the gripping story of three people torn apart, partly by war, but more so, by their own fears and mistakes. A year after her husband Craig’s death in Iraq, Kelly, a young therapist, is confronted by Peter, her husband’s twin brother, whom she has been avoiding. Their evening of trying to sort out issues of death, fidelity, politics and sexuality is interspersed by flashback scenes of Craig’s last night before shipping out to Iraq for the last time. The intensity is heightened by both brothers being played by the same actor. This production features performances by Sherry Pikul and Aaron Schuerr, and is directed by Marc Beaudin, all founding members of the CTC. Performances run 90 minutes and contain adult themes and language. The dinner option includes country chicken and pork tenderloin entrées with potato, side dishes fresh green salad and deserts crafted by Livingston’s MTPL8, operated by Melissa O’Hair who also owns the newly reopened FeedLot 49 at the Pop Stand. A full-service bar is also available at the Buckhorn, which opens every day at 1 p.m. Additionally, The Thirsty Bull, an on-site wine and spirits store, offers an extensive wine cellar. Wines from the store may be enjoyed in the bar and theatre. To purchase tickets, click on the date you’d like to attend and whether you would like to have dinner (beginning at 7 p.m.) or just the show. You will be directed to the Elk River Books secure online store. Simply click “add to shopping cart” then choose the number of tickets you’d like, and pay either by credit card or PayPal. Important: under “Choose Shipping Method,” select “In-store pickup” to avoid shipping charges — we will hold them for you at the door on the night of your performance. NOTE: The bar at the Buckhorn opens each day at 1 p.m. Dinner is served at 7 p.m. (advance tickets required). Friday and Saturday shows begin at 8 p.m. Those not having dinner are welcome in the bar beforehand. Sunday matinees: Bar at 1 p.m., Doors to theatre open at 2:30 p.m. and Show at 3 p.m.
Tickets purchased online will be held at the door the day of the show for pickup. 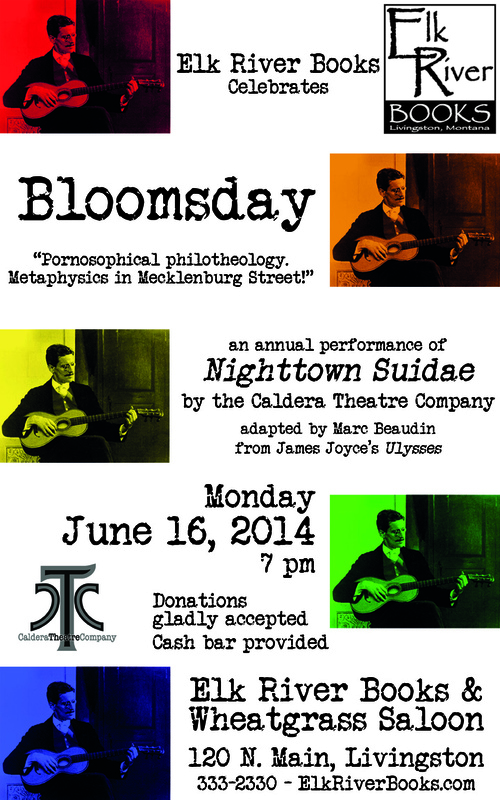 James Joyce fans the world over mark each June 16 as Bloomsday, honoring the day the groundbreaking novel Ulysses takes place, chronicling the Dublin-wide odyssey of its central character, Leopold Bloom. Livingston’s Elk River Books joins the celebration with a performance of live theatre by the Caldera Theatre Company at the bookstore’s new home, 120 N. Main St., on Monday, June 16, at 7 p.m. The evening features the annual performance of Nighttown Suidae, Marc Beaudin’s adaption from an excerpt of the novel. The comedic play comes from the Circe episode, where Bloom follows Stephen Dedalus and his drinking companion, Lynch, to Dublin’s red light district. It’s a surreal revelry of poetic language and wild imagery. The reading runs roughly one hour and contains adult language and sexual references. With the audience calling out lines spoken by hallucinatory characters such as bedsprings, chickens and bars of soap, the play becomes a sort of Rocky Horror for the literary-minded. The cast for this year’s show includes Caldera members Marc Beaudin, Bret Kinslow, Sherry Pikul and Aaron Schuerr, and is rounded out by ZuZu Feder and Francis Wendt. The Mint Bar will provide a cash bar, serving the traditional Guinness as well as other Irish favorites. Admission to the performance is free, although donations for the cast are greatly appreciated. Elk River Books and the Wheatgrass Saloon (sharing the Main Street space) offer readings, book signings and other arts events, as well as a curated collection of used and new books, juices, smoothies, vegetarian lunches, cards, maps, journals, gifts and fair trade items. For more information call 333-2330 or visit ElkRiverBooks.com.